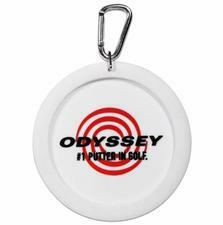 Odyssey Golf Putt Target (Instant Hole Target) - $4.95 - GolfersEdgeOnline.com - Best Golf Equipment On The Web! The Odyssey Putt Target is regulation size and great for indoor OR outdoor use. On a crowded putting green, you can create your own target and it clips conveniently to any golf bag when you're finished. If you have any more questions about the Odyssey Golf Putt Target (Instant Hole Target); do not see the model you are looking for; need custom options; or prefer to not purchase online, then please call us at (630) 656-1291.